How simply and recognisably can we draw buildings? Inspired by Things Magazine's recent note on buildings as logotypes (London's Gherkin building and NatWest tower, etc), Rodcorp went back to an old favourite: "How simply (or in how few lines) and recognisably can we draw buildings?". The question tends to privilege strong silhouettes and bridges, but so be it. Here's a list (with the help of Arup's Mr Urick, a clever man who spends his days designing buildings) and some drawings from unreliable memory. Sydney: The Sydney Opera House, the most recognisable building of all surely?, next to the Harbour bridge (which may only be unambiguous when it's next to the Opera House). London: Tower Bridge. Barcelona: La Sagrada Familia. Paris: Eiffel Tower. Athens: The Acropolis. Paris: La Defense. New York: Flatiron. Orlando: Epcot Centre. London: The London Eye. New York: The WTC towers, Statue of Liberty, Empire State (though confusion with Chrysler?). San Francisco: Golden Gate bridge. And perhaps the TransAmerica pyramid. Moscow: St Basil's Cathedral, Red Square. Los Angeles: Hollywood sign (building? structure?). Angkor Wat or various other pre-modern cities. St. Louis: St. Louis Arch. Rio de Janeiro: Statue of Christ the Redeemer. London: Big Ben you idiot! (quoting Urick). Hong Kong: Bank of China. Rome: The Vatican (Michael Angelo's "arms" in front), the Pantheon (the dome and skylight from the inside). 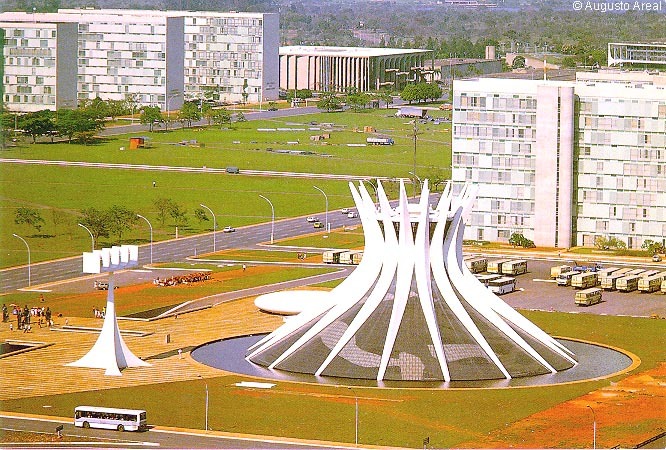 Many things in Brasilia by Oscar Niemeyer. Tesugen on imageability of cities, and Webb on the same: Lynch's Image of the City. And then: Constantin Boym's missing monuments, and buildings of disaster. And you could even download world landmarks for The Sims (more here). CityOfEverythingInteresting has a much less literal way of drawing simply, and is asking whether his sketches of the Bilbao Guggenheim are recognisable. We haven't yet made a Rodcorporate trip to Bilbao, but his sketches are indeed recognisable, avoid Jonathan Bell's fear of building-as-logo (see the comments) falling short of building-as-architecture. Perhaps they even recognisably reveal the building's references: is this an echo of Niemeyer's Brasilia cathedral? In the bridges category you can include The Golden Gate Bridge in San Francisco. Like the Parisian tower it is inescapable as a logo for the city (though it does require a few more lines than the tower). If all else fails, lower your standards.